1. Cook pasta as directed on the package. 2. 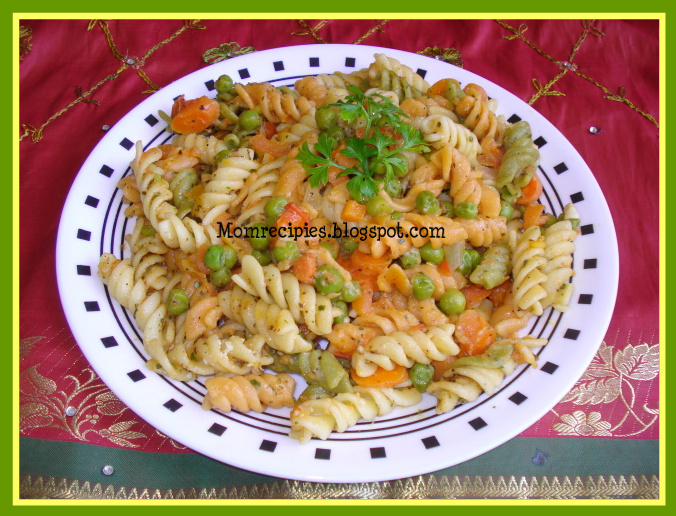 During the last 3 minutes of cooking the pasta, add the chopped carrots and peas. 3. Drain pasta and keep it aside. 4. Heat oil in a pan.Add fresh tomatoes and let it cook for 5 mins. Then add cooked pasta. 5.Sprinkle Italian seasoning and garlic powder over pasta. Add salt and pepper to taste. Gently stir to mix.Switch off the stove. 5. Transfer pasta to serving platter. Sprinkle with Parmesan cheese. 6. Serve and Enjoy yummy Pasta !!! Wow! Pasta. I love preparing Pasta, noddles.. when there is less time and stomach starts shouting for the food. I will try preparing it with carrots and peas as directed. I am not sure whether I will get the cheese described in the last para. I will try a normal cheese.